Hi everyone! This list was supposed to go up Saturday, but my website was down over the weekend due to server issues. Now that it’s back up, I decided to keep the date on it even though it’s going up on Monday. Sorry if it causes any confusion! So… Nintendo released Super Mario Run this past week. I know it’s a big deal to a lot of people, but I’ve never been a big Mario fan and this one is no different. So, I won’t be talking much about that here. Instead, I’ll discuss the other games I’ve been playing. First off, I finally finished Kathy Rain by Raw Fury and Noio. You can see my complete video walkthrough here. The game is very well-written, a bit light on puzzles, but the story and dialogue held my attention and kept me interested until the end. There were some bizarre story bits, but overall I really enjoyed it. The ending (and the subtitle A Detective is Born) implies there could be more Kathy Rain adventures, and I hope there will be! I’ve also been playing an upcoming game called PZZL. It’s not releasing until January 11th, but I’ve been enjoying it as a one-handed game that’s easy to play anywhere. You can see some gameplay video below. I also picked up Necrosoft Games’ puzzle and tower defense mashup, Gunhouse. I initially grabbed it because of the quirky art style, not really knowing what to expect. And, although it started off a bit too easy, I’ve since spent a lot of time with it and can’t get enough. Basically, each day is split into three stages — noon, dusk, and night. Each stage starts with a sort of match-4 puzzle that’s on a timer. You have a certain amount of time to make matches that power your weapons, until the door on your gunhouse closes and you have to fight off the waves of monsters. When you run out of ammo, the battle pauses and you have another chance to make matches and build up more weapons. The first two stages of each day are usually fairly easy, but provide cash for making important upgrades. The night is where things get tough, as it always includes a boss at the end. The game is very generous with cash, though, and weapon upgrades can be completely refunded so you can try out other weapons. This lets you mess around until you find the weapons that work best for you. And of course, on top of it all, there’s the artwork that’s just so full of character. I’ve already beaten the main campaign, which is ten days, but I’m now on night 13 and I think the game is endless. If you’re looking for something a little different and don’t mind the fast pace of the puzzle part, I recommend checking out Gunhouse. It’s the game I’ve been spending the most time with this week. I also played through Borderleap’s relaxing puzzler, minimize. I was a little underwhelmed by it, as it started off fairly tricky, then got much easier, and then tricky again in the end. You basically slide all the tiles at once, a la Threes! to match up tiles of the same color until all are gone. The most interesting part about it is that certain tiles are stuck in place, so if you don’t match them at a certain point, you could end up stuck with them unmatched at the end. When more tiles fill the board, it could be difficult to differentiate small differences in colors. I’m also not sure how playable the game is for colorblind folks. Even though it contains 100 levels, I went through them pretty quickly. I wish it had a bit more complexity to offer a steady increase in challenge. I think I would have an easier time recommending it at a throwaway $0.99, but it might be disappointing for some at $2.99. You can check out my video below to see if it’s something you’d like. I also started a walkthrough here. I also played some of Snakes – Move Snakes, Fill Board by Ultrapped Ltd. This one is also very easy and takes a long time to ramp up the difficulty. But it’s free and worth trying. It didn’t hold my attention too long, but I do appreciate its minimal, streamlined design that isn’t pushy with the IAPs. 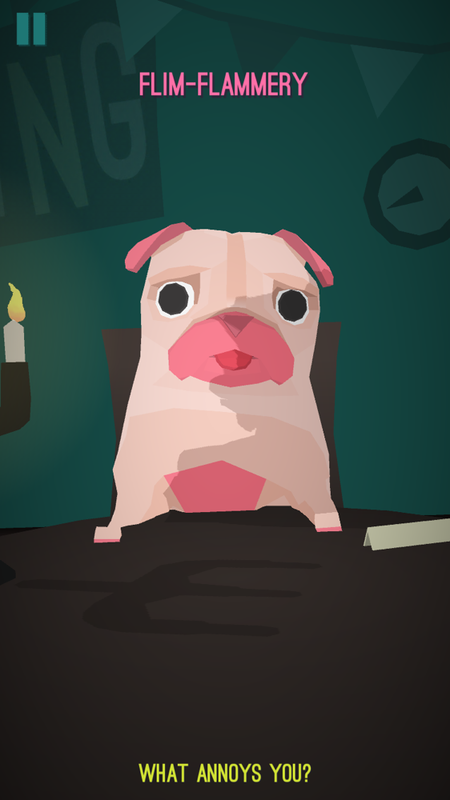 I also picked up Hot Date, a silly pug dating simulator by George Batchelor. It came out at the end of last year, but went on sale for a buck so I decided to give it a try. It’s nothing revolutionary, but worth a few chuckles. I haven’t taken any video of it yet, so a screenshot will have to do for now. I also played through Escape the Lighthouse Island by angel oliva mangas. It’s a very short — but free — adventure game with a unique art style. You can see my full walkthrough in he the video below. I also tried some other games that I didn’t like at all, so I don’t see the need in mentioning them. But as always, you can subscribe to my YouTube channel to see what other games I’ve played. Until next time, that’s My Week Unwrapped! thanks! going to try a few of them and put minimize on my wishlist for now.